We were really happy with the amount of feedback we received regarding our Christmas calendar. So thank you all! And it’s why we decided that this year we’re going to be writing a monthly blog post telling you what’s going on here at Frozenbyte. We’ll be calling these Monthly Reports! Pretty creative, right? In addition to regular announcement plans we also had the opportunity to attend the Nintendo Switch event in London and later PAX South in Texas. We were showcasing Has-Been Heroes at both events. 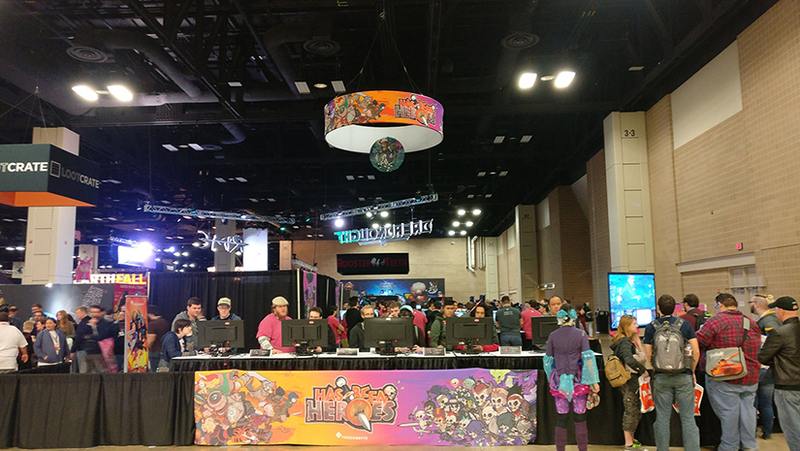 Here is our booth from PAX South in Texas! 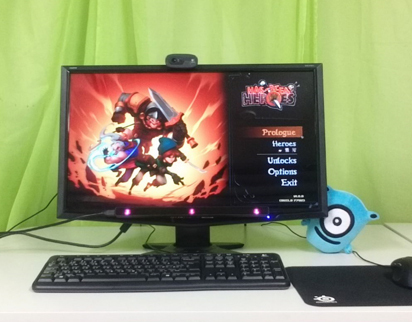 We, the Support team, have also been busy with arranging usability tests for Has-Been Heroes. Yes, some lucky people have gotten the chance to play the game in advance. It has been fun to observe the players’ emotions; there has-been frustration that turned into a feeling of success. The players’ feedback is very valuable to us because it helps us to refine our games further. 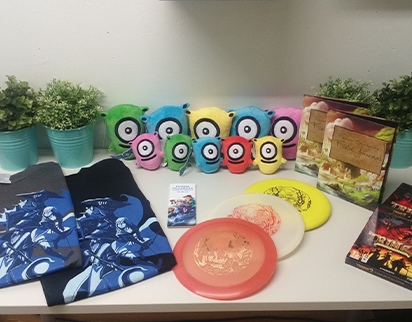 If you happen to be in Finland and if you are interested in playing unreleased games at our office, please take a look at our Playtesting page! This month we also faced some challenges. As you might have seen, we have been looking for new employees. We have hired a bunch of new people and bumped into an issue regarding space (there isn’t that much left). People are sitting with their knees in their mouths or toes on top of someone else’s keyboard. Okay, that might have been an exaggeration… but I think you got the point. Our QA lead has done a very good job in fitting everyone in, I bet he is great at Tetris. Our catering team did also an amazing job in transforming the storageroom into their break room, it’s surprisingly cozy in there. We’re actually still looking for more people to join our crew! We still have a few comfortable cupboards available. Kidding, kidding. There will be room for you. Some people were also crazy enough to play badminton in a nearby sports center. Nerds playing sports, isn’t this just the craziest idea! 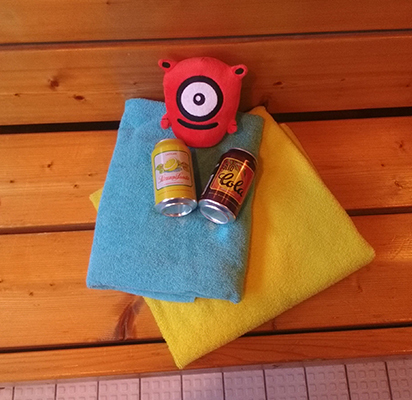 On Fridays we also heat up the sauna and enjoy some refreshments. 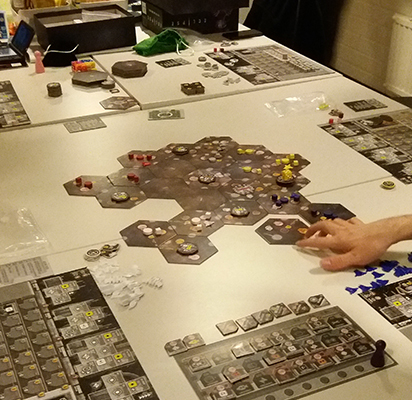 On our free time we also played board games, like Eclipse shown above. Splot seems to be on its way to sauna! Is there anything you would like to ask us about our daily work? We would love to answer your questions in next month’s post. Which boardgame is that in the picture? What boardgames do you usually play in the office (if any)? It’s Eclipse: New Dawn for the Galaxy (more info here). I see you have some merchandise there, so I can assume you have some connections to the toy instutry. So it would be so cool to see a Has-Been Heroes -amiibo. Please, Frozenbyte, make that happen! We don’t have any big connections to toy industry, but maybe we can look into this in the future. Though I can’t promise anything at this point. How many people do you currently have? You seem to have been growing and expanding a lot. I just wanted to ask about how Has-Been Heroes will function, regarding the regions on the map and the levels. Once the first two regions are completed the next one will be unlocked up until the final eighth. The story will be the same I presume, but what about the spells and items? Are the items and spells specific to the region? Let’s say a Warhammer drops on region six, will it be obtainable in the earlier regions? If so, will this system be used by the spells too? Sorry I seem to have missed your question! After a playthrough you unlock bunch of spells and items that weren’t available before. During your next playthrough you might get these older spells/items or something new. You can also unlock new items/spells after you die (if you have collected enough souls before dying). So, if Warhammer is unlocked in your sixth playthrough, there is a possibility you get it in any of the regions in that playthrough. That explains everything, thanks for answering. Can’t wait to try it. Will Ari Pulkkinen provide the music for Has Been Heroes? Will the Trine franchise be revisited? Has-Been Heroes music is done by our awesome in-house audio team. Ari has done some music for Nine Parchments which happens in the trineverse. Nine Parchments is coming later this year. And in Has-Been Heroes, well, in the beginning you play with the rogue, the monk and the warrior. 😉 Tam, Metacles and Crux are just as neat as our original heroes! Do you have any plans to port Trine 3 to Nintendo Switch? The first 2 games on Wii U were my favourite games on that system…. Bar none.